If your home office is anything like mine you never have enough desk space. When I finally get around to clearing things off my desk it doesn’t take very long before new things appear. Sometimes I think empty space on my desk becomes magnetic and attracts new stuff that accumulates. My problem is where do I put my MacBook Air, iPad, and iPhone, when I get home from work or travel? Maximizing the desk space you have is key to getting the most use. Laying my MacBook Air, or iPad flat takes up a lot of valuable space. So why not stand them up? Here are products that might help you reclaim some of your valuable desktop space. 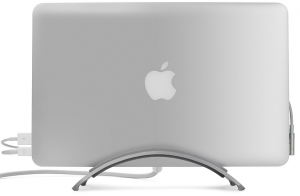 The BookArc is an aluminum stand that holds your MacBook Air (MBA) in a closed upright position. The slot that holds your MBA is covered in soft silicon and is a snug fit as you slip your MBA into the slot. The BookArc is made out of a heavy piece of aluminum weighted just right so your MBA will not tip over. A slot in the back helps cable management especially if you want to use your MBA in clamshell mode connected to an external monitor. Removing your MBA from the BookArc is very easy. The good folks at twelve south explain that there is a “trick” to it. If you try and pull your MBA straight up the stand will come with it. The trick is to tilt the MBA slightly and then pull up. Using this method will allow you to retrieve your computer with just one hand. However, as much as I hate to admit it, after several months I have not been able to master this one handed grab, so I continue to use two. 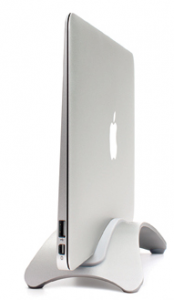 The BookArc also has silicon footpads so it will never scratch up your desk. Even the box the BookArc comes in is useful with a list of twelve (coincidence?) things you can use it for included in the instruction sheet. 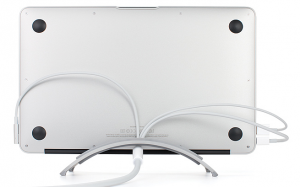 The BookArc for MacBook Air is compatible with all models except the first generation. I really like this product. It is well made and easy to use and I might toss this in a suitcase when traveling. Twelve South also makes a BookArc for the MacBook line of Apple portable computers. 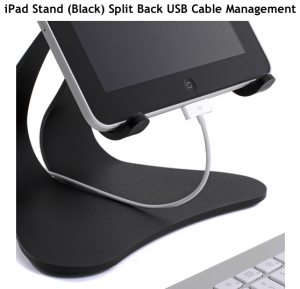 This stand is similar to the BookArc in design but all similarities end there. The NuStand Alloy (NSA) is made of a lighter aircraft grade aluminum with a rubberized black finish that makes it soft to the touch and scratch resistant. The slot in the middle has a silicon gasket that holds your iPad in either portrait of landscape mode. Non skid rubber feet keep the NSA from sliding off your desk and from scratching it. The NSA is very light and the slot that holds your iPad is wider than the thickness of your iPad so thin cases like the NewerTech NuGuard case will fit in the NSA without having to remove it. I don’t have one of those cases but I use a Kensington thin case which doesn’t quite fit in the NSA. However, I can open the cover and slip my iPad into the NSA which is acceptable. I wish the NSA was a tad wider. So lightweight you could take it with you when you travel, a silicon center with non-skid rubber feet, and a rubberized coating to prevent scratches all make the NuStand Alloy a good choice to hold your iPad. Looking for something really solid and stable? 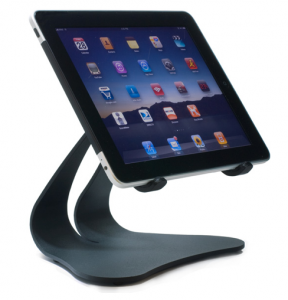 Look no further than the Stabile 1.0 iPad Stand from Thought Out Company. This stand is made from solid steel and weighs in at a nearly four pounds. The four points that contact your iPad are made of santoprene and the four non skid black feet are made of polyurethane. The feet keep the Stabile from scratching up your desk and the santoprene contact points keep your iPad scratch free as well. Each of these is available as a spare part should you ever need to replace one. 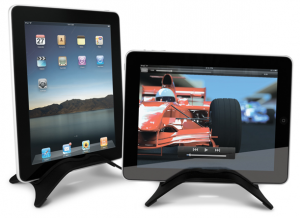 This is a solid stand that can be used with any kind of iPad case, skin, or bumper since your iPad just rests on the four points in either landscape or portrait orientation. The design allows for a cable to slip through the “V” shaped opening in the back for easy cable management, and the static 55° viewing angle is perfect for viewing the iPad or using an external keyboard. I can’t imagine traveling with this stand if I had to fly somewhere, but tossing it in the back of the car for a driving summer vacation where I’ll spend a week or more at the beach is certainly something I can see myself doing. 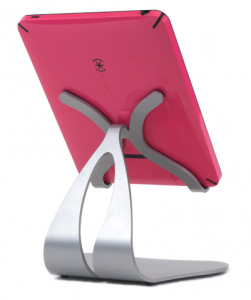 The stand in available in a black, silver, or white finish. I should have taken a picture of my messy desk before I began to utilize these stands. I didn’t but you can. Send me some before and after shots of your messy desk. Now you have no excuse when it comes to reclaiming some of your desk space.